The newly renovated, landmark Royal Sonesta New Orleans hotel welcomes Jackie Lopez as its executive pastry chef. Jackie brings vast expertise in pastry creation, after almost a decade of service at various renowned hotel properties. Travel Pulse got a glimpse into more of her career and creation of sweet treats. Q: How did you get started working with pastries and confections? Jackie: I was studying public relations and communications at the University of Houston, but I was an Ace of Cakes fanatic, and used anyone’s birthday as an excuse to bake a cake. One day, my friend and I were riding around town getting supplies for his graduation party, and we stopped at a small Japanese bakery for his cake. I was blown away. Their presentation was something I had never seen before. Everything was so colorful, shiny and exotic. I still go to that bakery every time I’m in Houston. My goal is always to ignite the same feeling I had when I first laid eyes on their desserts. Q: You’ve gained experience in many different parts of the country. How does that tie into your everyday work? Jackie: Moving around allows you to learn about all kinds of different ingredients, dishes, cultures and styles of cooking. Every area, city, town and hotel has a different vibe, and it’s always so much fun figuring out how to apply that to my pastries. Sourcing our products locally is such a huge part of that, because you highlight what you have at your fingertips. Q: Having built experience in New Orleans, you’re no stranger to the Crescent City culinary scene. What are some of your standout dishes that reflect the city? Jackie: New Orleans is where I was really able to develop my own style and identity as a pastry chef. No other city on Earth has as much character and culture as New Orleans. There are so many different ingredients and dishes that are staples in the city, and that gives you so much to work with. That being said, a couple of my favorites would have to be our Banana Foster Cheesecake, which is soon to be added to the dessert menu at Desire Oyster Bar, and my Pecan, Creole Cream Cheese & Spiced Rum Roulade. Q: You’re competing in the New Orleans Wine and Food Experience’s upcoming The Big Gateaux Show, a pastry competition and burlesque showcase, on May 27. After twice taking first runner-up in the competition, what is your strategy to win gold this year? Jackie: Practice, practice, practice! We are as prepared as we can possibly be. I always stress myself out in the weeks leading up to a competition, then once I’m there and we’ve started, I calm down and tell myself, ‘This is easy. This is what I do every day.’ Now I just need to get my playlist ready; tunes are vital! Q: Mardi Gras season saw your special Royal King Cake, a one-of-a-kind brown butter bourbon pecan praline cake. What was your inspiration? Jackie: Our executive chef, Jeff Mattia, wanted something decadent and luxurious. We zoned in on bourbon, and after that, it was just a matter of what is delicious with bourbon. In the end, it was brown butter, pecans and praline. We covered the cake in Valrhona dark chocolate ganache and Mardi Gras-colored croquant. Q: Royal Sonesta New Orleans is one of the city’s favorite wedding venues. What is your approach to working with brides to fulfill their perfect wedding cake visions? Jackie: This is probably the most fun part of my job. Some brides come in and hand me a picture of exactly what they want, but there is nothing cooler than a bride who wants to design a custom cake with me. I’ll show them pictures of my work, and they send me pictures of décor, cakes and things they like so I can get an idea of their style and how to tie the cake in with the rest of their wedding. In a couple of months, we will even be working with a design company to hang a cake from the ceiling so it will look like it’s floating. Q: What is your favorite cake that you’ve made? Jackie: It’s hard to pick one favorite, but I recently spent a couple of months designing a wedding cake with a bride. 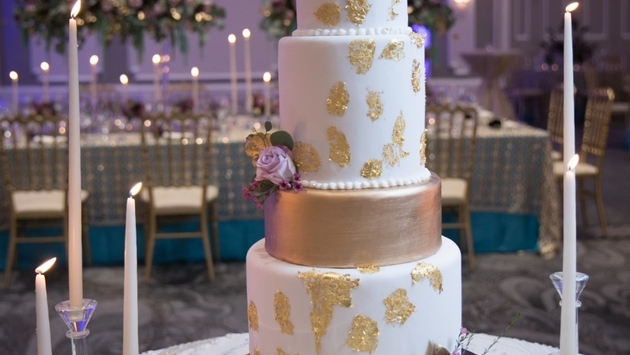 We came up with a truly one-of-a-kind cake for her big day: a seven-tier cake at more than 4 feet tall, with gorgeous bright gold Marie Antoinette-style flourishes. I also love to make fun groom’s cakes. Recently, we had a groom who requested a Yeti cooler, crawfish, Abita beer and LSU be tied into his. The outcome was incredible, with a chocolate bottle of beer, cookie coasters and all. Q: How do you collaborate with Royal Sonesta New Orleans’ Executive Chef Jeff Mattia? Jackie: I love working with Jeff. We have a lot in common, from our eye for design to the style of cooking we enjoy. We both have high expectations for ourselves and the culinary team, and we have a blast writing menus and conceptualizing buffets, action stations, etc. We can take care of any dining needs, from restaurant outlets and corporate events to weddings and festivals. He gives me total creative freedom and trust, which is so important to a pastry chef. Q: Any special tips for at-home bakers and pastry chefs? Jackie: I try to live by this quote from Kahlil Gibran, “If you bake bread with indifference, you bake a bitter bread that feeds but half man’s hunger.” The most important ingredients in anything are love and passion. Also, make sure your oven is calibrated! Chef Jackie’s love and passion for her craft will make an appearance in the 2017 Summer/Fall issue of Southern Bride Magazine, featuring the custom wedding cake pictured above. Located in the heart of the French Quarter, Jackie adds a new dynamic to Royal Sonesta New Orleans’ world-class staff and amenities. Offering 20,000 square feet of special event space, the hotel takes care of all dining and event needs in-house, from design to delivery. For more information, visit Sonesta.com/RoyalNewOrleans.